Last year Lithuanian residents’ opportunities to save and invest grew, and significantly more people think their financial situation improved over the past three years. According to the Lithuanian Investment Index compiled by INVL Asset Management, one of the country’s leading asset management firms, in 2018 the biggest return was had by those who invested in rental housing. That asset class last year had a return of 8.1%. It overtook shares of Lithuanian companies, the country’s best-performing asset class in 2016 and 2017, which last year had a negative return of -5.6%. The return on deposits remained at zero for a fourth year in a row, and the return on long-term Lithuanian bonds decreased slightly to 0.3%, falling short of the 2.5% rate of inflation. “Rental housing, which in 2018 surged into first place, has had a similar return in each of the last five years, ranging from 7.7% to 9.7%. In 2018 it surpassed the country’s other asset classes, including shares of Lithuanian companies, which in 2016 and 2017 showed an especially high return. Despite their decline in 2018, over a five-year period Lithuanian stocks generated a similar return (46%) to that on rental housing (50%). In fact, Lithuanian stocks fell less last year than European or global equities, and had a bigger return than either of them over the last decade (2009-2018). It’s worth noting that both for the last decade and for a 23-year period, the return on the European, global, and Lithuanian equity markets was solid and significantly exceeded inflation,” said Vaidotas Rūkas, the Chief Investment Officer at INVL Asset Management. Lithuanian stocks fell last year for the first time in 5 years and had a small loss of 5.6%, compared to annual gains of 17% in 2017 and 14.9% in 2016. The return on deposits, which in 2014 was 0.4% and exceeded inflation, has since then stayed at zero. The return on the country’s long-term bonds, which was 5.1% in 2014, later shrank and, falling short of the inflation level for a second year, was 0.3% last year. By that measure if underperformed German long-term bonds, but earned more than 10-year U.S. bonds. Looking at the long term, in 1996-2018 all the country’s asset classes provide those who invested with a return bigger than inflation. Rental housing had the biggest average annual return in those 23 years, at 14%, while Lithuanian stocks were in second place with a return of 8.6%. Lithuanian long-term bonds brought average interest of 6.4%, and deposits 4.6%. Meanwhile, for the 10 years from 2009 to 2018, Lithuanian stocks were the most profitable (13.2%), with bonds in second place (5.2%) and rental housing third (3.1%), while deposits generated annual interest of 1.5% and fell short of the 2% inflation rate. “The 10-year return on rental housing is still impacted by the last crisis. Stocks stood out for gains over that period, as the bottoming out of the stock market in 2009 was followed by a decade-long bull market ever since, with stocks rising fast. So the historical data once more confirms long-term investing offers a chance to avoid short-term fluctuations, and spreading investments across different asset classes lets you balance risks and expect stable portfolio growth,” Vaidotas Rūkas stressed. 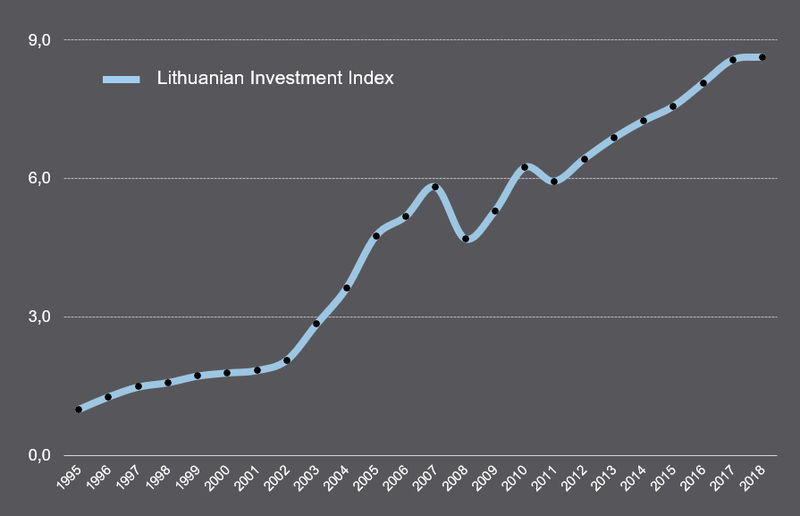 The Lithuanian Investment Index gives equal weight to annual assessments since 1995 of money market instruments (deposits), long-term Lithuanian bonds, rental housing (as of 2016 calculated net of expenses) and stocks. Last year it grew for the seventh year in a row. The long-term average annual return on the index in 1996-2018 was 9.8%, a level surpassed during the period by the return on rental housing (14%). According to this index compiled by INVL Asset Management, the average return on investments in Lithuania in 2009-2018 was 6.3%. In 2018 the return on the index was 0.7%, while in 2017 it was 6.3%. The index’s minimal increase in 2018 was due to the stock markets’ negative return and stability of the return on rental housing. According to Vaidotas Rūkas, in the future, earnings can be expected from stocks and rental housing, while deposits and Lithuanian government bonds will remain without gains. “In the short term stocks tend to fluctuate, but over the long term they have promise due to the sustainable growth of the economy. Growth of housing prices may be close to the level of inflation, with rental yields likely to provide a bigger return component. For Lithuanian bonds, over the short and medium term we can’t foresee returns like those we’ve had historically. As regards deposits, no changes are expected,” he said. The investment specialist noted that optimal results over the long term are achieved by breaking investments down according to risk. One instrument for doing so is pension funds, which focus on long-term gain. The 2nd pillar pension funds that operated in Lithuania in 2004-2018 offered the chance to invest in asset classes of different risk, ranging from bonds to shares, based on an approved investment strategy. The average return on the 2nd pillar pension funds that operated until now, depending the period, was at the level of that on stock and bond gains in various regions. The funds’ average annual return over the past decade was 5.4%, and for period from 2004, when the funds were established, to 2018, it was 4.2%. Last year the country’s pension funds had a 3.9% loss due to market volatility, but the drop was short-term – within the first three months of 2019 most pension funds had already offset that annual loss. As of 2019, 2nd pillar pension funds in Lithuania operate on a life-cycle basis, i.e., their investment portfolio changes based on the age of the fund’s participants, adjusting the ratio of riskier and less risky asset classes (considering the length of time left for the fund’s participants to participate in pension accumulation). Rising wages made the past year a good time for the country’s residents to save and accumulate for the future. Moreover, people themselves noticed the improving economic situation, with more of them assessing their financial situation better. According to data from Statistics Lithuania, the number of employed persons in the country grew 4.5% in a decade and was up 19% since 2009, reaching more than 1.23 million in the last quarter of 2018. Average wages also rose: in December 2018 the share of people earning more than EUR 700 (gross) a month was 54%, up from 48% a year before. Among them, the number of those earning from EUR 1001 to EUR 2000 (41,000 people) increased the most. The number of those earning less than EUR 400 (80,000) shrank the most. Lithuania’s average gross wage increased 44.5% over 10 years, and from 2009 rose 58%. During last year alone it rose nearly 10% and in the last quarter of 2018 was EUR 86 larger than a year earlier, at EUR 970.30. Positive changes in the area of wages did not go unnoticed and positively influenced people’s perception of their own and their families’ financial situation. According to a representative survey of Lithuanian residents conducted for INVL Asset Management by Spinter Tyrimai in February 2019, the share of people who think their financial situation improved over the last 3 years increased to 40% from 34% a year earlier, while the share of those who think it worsened shrank from 50% to 44%. The most common reason people’s financial situation improved was a bigger wage, while the most common reasons it worsened were rising prices or the loss of the job or a reduced wage. There were increases in the number of those saying their income increased but prices grew even more, or that their wage shrank or another family member lost their job. The people who most often saw an improvement of their financial situation were respondents aged 36-45, those with a higher education, those with the biggest income, and those who personally engage in saving. Over the past year, the share of people in Lithuania who could live off their savings for up to 1 year without changing their normal way of life increased from 7% to 9%. The share of those who could do so for 6 months was unchanged at the level of 22%, while the share of those who could do so up to 3 months shrank from 53% to 47%. Residents last year also began to plan their finances more, especially in the short term. The share with a financial plan for themselves or their family increased over the past year from 23% to 25%. Those planning their finances for periods of up to 10 years increased from 72% to 80%, while those planning for longer than 10 years decreased from 17% to 12%. The share of those who plan their finances for a period of up to 2 years grew especially – from 30% to 40%. Respondents who are men and residents of major cities more often have made plans for up to 2 years. Women more often have made plans for up to 5 years. It is recommended to have a financial plan for a period of more than 10 years. “On the one hand, residents’ financial situation improved last year, though they also felt the impact of rising prices. That trend along with growing wages encouraged people to plan their own and their family’s finances. That’s a positive shift suggesting that as their financial situation improves, people will more rationally plan their budgets and pay more attention to saving and accumulating for the future. On the other hand, most of those planning their finances are still focusing on a rather short time frame – it’s recommended to plan for a period longer than 10 years,” said Dr Dalia Kolmatsui, Head of Pension Funds & Retail at INVL Asset Management. Residents’ financial assets have also grown rather markedly over the past decade. According Bank of Lithuania data, the liquid financial assets of the country’s households (cash and deposits, life-insurance and annuity commitments, mutual funds, pension funds, debt securities and loans, and listed shares) totalled EUR 20.7 billion in the third quarter of 2018, compared to EUR 18.8 billion a year earlier (EUR 17.2 billion for the same time in 2016, EUR 11.1 billion in 2009). Changes in this portfolio show that the biggest increase was in the share of funds in the long-term accumulation instrument incentivized by the state – pension funds. The amount of money accumulated in them grew 3.6 times from the third quarter of 2009 to the third quarter of 2018, to EUR 3.3 billion. The share of debt securities and loans decreased the most since 2009, from 9% to 3%. The share of cash and deposits in the portfolio also decreased notably, despite the fact that their amounts grew by 79% between 2009 and 2018. Still, cash and deposits have consistently made up the biggest part of holdings in the portfolio: 71% in 2018, 72% in 2016, and 74% in 2009. “Allocation changes in the financial portfolio show that people in Lithuania are still reticent to invest in financial instruments with a bigger return, and most of their money is still held in deposits and accounts the pay a zero return. Considering inflation, that money not only isn’t earning a return, it is losing value. A positive change is the growing share of financial assets in pension funds. Growth of accumulation for the future is also due to state incentives, and we see more interest by people in accumulating for a pension and rising expectations for future income during retirement,” Dr Kolmatsui said. The survey of Lithuanian residents also showed that over the past year, the share of people planning in retirement to live off of money accumulated in pension funds increased from 41% to 48%, while those still expecting to live off a state social insurance (Sodra) pension fell from 88% to 78%. The share of those intending to work during retirement also shrank somewhat, from 22% to 19%, and the share of those planning to live off of real estate they have rose from 8% to 12%. “More and more people in Lithuania understand that just the pension paid by Sodra won’t provide the quality of life they want. So it’s natural that more and more are planning to live in old age off of money accumulated in pension funds and otherwise, which lets them approach the desired quality of life. Income expectations in retirement have also grown, so, to ensure that income is provided for, saving in both 2nd and 3rd pillar pension funds is recommended,” Dr Kolmatsui stressed. To the question what share of their current income would be needed for quality of life in retirement, people most often indicated 100% (41% of respondents) or 75% of their current income (34% of respondents, while 12% said half of their current income. In terms of expectations for retirement, one-fifth of people are looking to get 75% of their current income – nearly twice as many as a year earlier, when 12% of respondents expressed such expectations. A third of people want to get 50% of their current income during retirement – similar to last year’s share. Nearly one in ten expects 100% of their current income in retirement. INVL Asset Management is part of the Invalda INVL, one of the leading asset management groups in the Baltic countries. The group’s companies manage pension and mutual funds, alternative investments, individual portfolios, private equity assets, and other financial instruments. Over 190 000 clients in Lithuania and Latvia and international investors have entrusted them with more than EUR 650 million of assets. * Housing acquisition and rental returns calculated on the basis of Ober-Haus data. ** Since their creation in 2004. Information is provided for information purposes and cannot be construed as a recommendation, offer or invitation to invest in funds or other financial instruments managed by INVL Asset Management. When investing, you assume the investment risk. Investments can be both profitable and loss-making, you may not obtain financial benefits and you may lose some or even all of the invested amount. Past results of investments do not guarantee future results. When making a decision to invest, you should assess all the risks associated with investing and the key investor information documents. INVL Asset Management is not responsible for any inaccuracies or changes in this information or for losses that may arise when investments are based on this information.